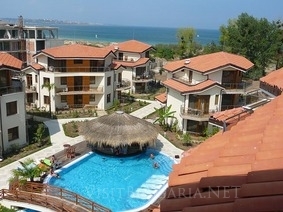 Location: Overlooking the King’s beach Laguna Beach Resort is located in the picturesque setting between a small river and the sea, situated a mile from the old town of Sozopol and 30 minutes drive from the International Airport of Bourgas. Accommodation: Laguna Beach Resort comprises of 46 double rooms, 60 apartments, all with private balconies. There are 21 spacious elegantly designed and furnished studios at guests' disposal as well.